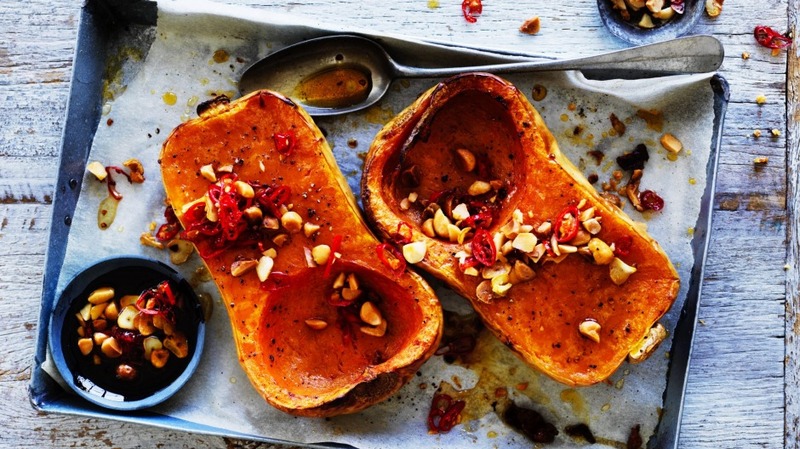 A roasted pumpkin is a beautiful thing. Heating it slowly boosts sweetness and reduces moisture, giving it a rich, silky texture. 1. Heat your oven to 175C. Cut the pumpkin in half lengthways and scoop out the seeds. Drizzle with 1 tablespoon of the olive oil and season with salt and pepper. Place the pumpkin on a lined baking tray and roast, uncovered, for 75 minutes. 2. When the pumpkin is cooked, heat the remaining 2 tablespoons of oil in a small saucepan over medium heat and add the garlic and chilli. Stir for about 2 minutes until the garlic is browned, then remove from the heat and stir through the vinegar, brown sugar and chopped macadamia nuts. Spoon the garlic, chilli and nut mixture over the pumpkin, including any liquid, and serve.